Rally to challenge CDCR practices on south steps of Capitol Building, 11th and N streets, Sacramento, Tuesday, Aug. 23, 11 a.m., then testify at Assemblyman Tom Ammiano’s hearing. 1:30 – 3:30 p.m. Car pools leave from West Oakland BART at 10 a.m.
Sacramento – The Prisoner Hunger Strike Solidarity coalition will hold a press conference Tuesday, Aug. 23, 11:00 a.m. at the California Capitol Building in Sacramento where families of prisoners, community members and activists from around California will converge to rally and participate in a legislative hearing of the Public Safety Committee of the California House of Representatives on conditions in Secure Housing Units (SHU) in state prisons around California, including Pelican Bay. The hearing, initiated by State Assembly member Tom Ammiano, was called in response to the recent prisoner hunger strike initiated by prisoners in Pelican Bay’s SHU. Over the course of the last two months, thousands of prisoners have drawn support nationally and internationally in condemning conditions inside of California’s SHUs, including the effects of long-term isolation on prisoners’ health. “Long-term solitary confinement causes severe mental and physical health effects that make it nearly impossible for an individual to function in society,” says Terry Kupers, a psychiatrist and expert witness in class action litigation on prison conditions. “Putting an end to this practice will not only reduce violence within prisons, but also give people a better chance to reintegrate into their communities when they are released.” Changes to SHU conditions have recently been implemented in other states, including Mississippi. 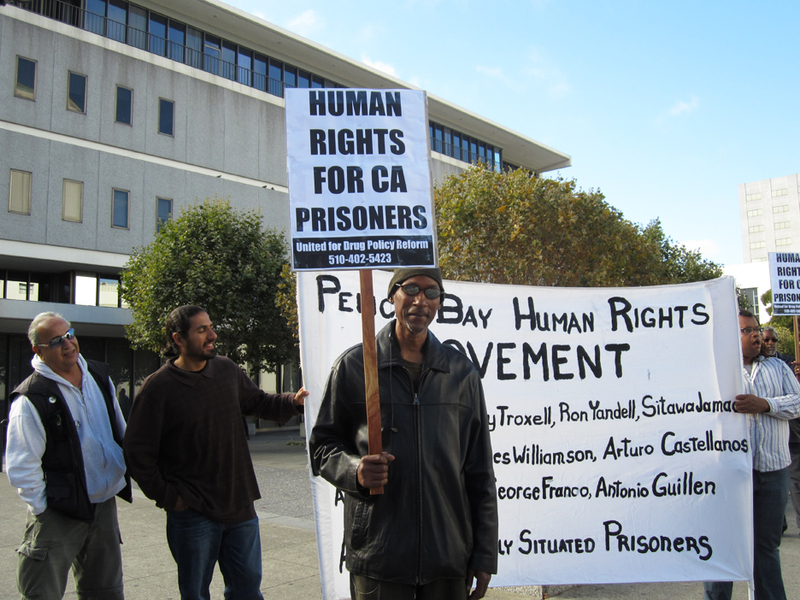 Prisoners at Pelican Bay paused their hunger strike on July 20, when the CDCR took minor steps towards negotiating with prisoners. Along with some concessions around demands for cold-weather clothing and educational opportunities, the CDCR indicated that it could make changes to debriefing and gang validation policies, as well as the practice of long-term solitary confinement. For more information about the rally and legislative hearing as well as future events, visit www.prisonerhungerstrikesolidarity.wordpress.com or call (510) 444-0484. The Center for Human Rights and Constitutional Law (CHRCL) in Los Angeles believes that the treatment of California prisoners placed in segregated administrative units should be brought before the United Nations. Placing thousands of prisoners in segregation for long periods of time is one of the most serious mass human rights violations taking place in the United States today. If prisoners agree, the CHRCL will prepare a petition probably addressed to the United Nations Working Group on Arbitrary Detention and the United Nations Committee against Torture. California’s segregation of prisoners violates the Convention against Torture and other Cruel, Inhuman or Degrading Treatment or Punishment, which the United States has ratified. The convention against torture is therefore binding on California. Solitary confinement is considered by many experts to be a form of psychological torture. If a United Nations committee determines that the treatment of California prisoners may be in violation of international law, it can request an on-site visit and issue reports calling for changes. Such actions could help to publicize the segregation and isolation of prisoners, and may lead to some improvement in the treatment of prisoners. The CHRCL is also considering whether a class action case may be filed against California in the state or federal courts alleging that the segregation of prisoners violates the United Nations convention against torture, as well as the U.S. Constitution. The CHRCL will not take any steps without first consulting with prisoners, their families, advocates and lawyers who have already done work on issues dealing with segregation and isolation. A cover letter and form prepared by the CHRCL to gather information about SHU/Ad-Seg/ASU cases may be obtained by contacting Kendra Castaneda at helpinginmates@gmail.com. Peter Schey is president and executive director of the Center for Human Rights and Constitutional Law, 256 S. Occidental Blvd, Los Angeles, CA 90057, (213) 388-8693, www.centerforhumanrights.org. As we have written before, the three-week-long hunger strike in the Security Housing Unit at Pelican Bay, which was joined by inmates at a dozen other California prisons, may have wrung few tangible concessions from the California Department of Corrections and Rehabilitation (CDCR). It achieved something less measurable, but, in some senses, far more important: For a few weeks, the men of the Pelican Bay SHU ceased to be invisible. They forced the media and the public to bear witness to their torment and see long-term solitary confinement for what it is: one of the most pressing domestic human rights issues of our time. The media’s responses varied, as did that of the public – as any reader of online comment will know. One of the publications that refused to turn its face away from the reality of prison torture was arguably the most important one of all: the New York Times. The Times not only covered the strike as news, but also addressed it directly on its editorial pages. Today, the New York Times’ lead editorial is “Cruel Isolation.” Appearing with the tag line, “A California prison protest spotlighted widespread use of torturous solitary confinement,” it was clearly inspired by the hunger strike. 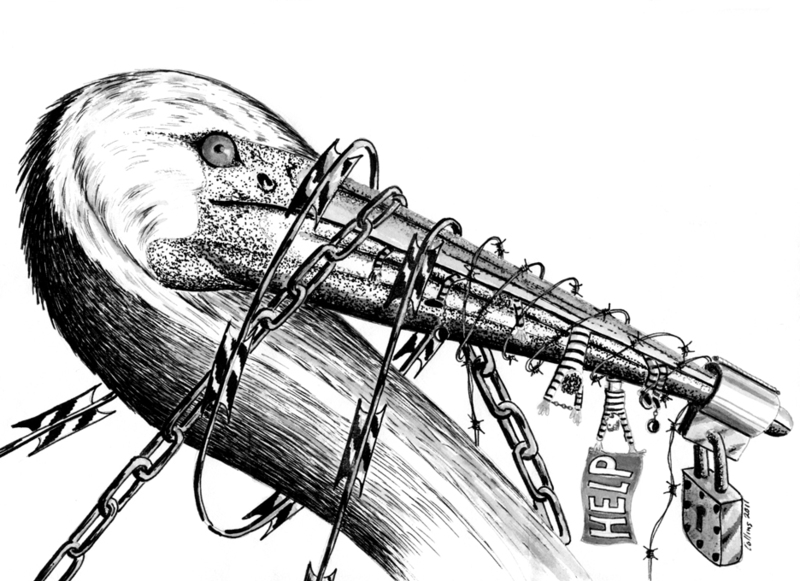 It states that, “The protest has raised awareness about the national shame of extended solitary confinement at Pelican Bay and at high-security ‘supermax’ prisons all around the country.” By publishing the editorial, the Times ensures that this awareness will be further raised and brings a desperate cry out of the depths of the Pelican Bay SHU to millions of readers worldwide. The full text of the editorial follows. “So Americans should be disgusted and outraged that prolonged solitary confinement, sometimes for months or even years, has become a routine form of prison management. It is inflicting unnecessary, indecent and inhumane suffering on tens of thousands of prisoners. “The issue came to the fore most recently because of a three-week hunger strike by inmates at Pelican Bay State Prison in California near the Oregon border that began on July 1 in the Orwellian Security Housing Unit, where inmates are held in wretched isolation in small windowless cells for more than 22 hours a day, some for many years. “Possessions, reading material, exercise and exposure to natural light and the outside are severely restricted. Meals are served through slots in steel cell doors. There is little in the way of human interaction. Returning to the general prison population is often conditioned on inmates divulging information on other gang members, putting themselves in jeopardy. “How inmates in these circumstances communicated to organize the protest is unclear, but it quickly spread to other California prisons. About 6,600 inmates participated at its peak. California’s huge prison system is dysfunctional in so many ways. “In May, the Supreme Court found conditions at the overcrowded prisons so egregious that they violated the Eighth Amendment’s ban on cruel and unusual punishment and ordered the state to cut its prison population by more than 30,000 inmates. The case did not address the issue of long-term solitary confinement. “With their health deteriorating, those inmates continuing to fast resumed eating after state prison officials met a few modest demands. Inmates in Pelican Bay’s isolation unit will get wool caps for cold weather, wall calendars to mark the passing time and some educational programming. “Prison officials said current isolation and gang management policies are under review. But the protest has raised awareness about the national shame of extended solitary confinement at Pelican Bay and at high-security ‘supermax’ prisons all around the country. “Once used occasionally as a short-term punishment for violating prison rules, solitary confinement’s prevalent use as a long-term prison management strategy is a fairly recent development, Colin Dayan, a professor at Vanderbilt University, said in a recent Op-Ed article in the Times. Nationally, more than 20,000 inmates are confined in ‘supermax’ facilities in horrid conditions. “Prison officials claim the treatment is necessary for combating gang activity and other threats to prison order. It is possible to maintain physical separation of prisoners without ultra-harsh levels of deprivation and isolation. Mississippi, which once set the low bar for terrible prison practices, saw a steep reduction of prison violence and ample monetary savings when it dramatically cut back on long-term solitary several years ago. James Ridgeway and Jean Casella are co-editors of Solitary Watch, an innovative public website aimed at bringing the widespread use of solitary confinement and other forms of torture in U.S. prisons out of the shadows and into the light of the public square. A unique collaboration between journalists and law students, Solitary Watch’s mission is to provide the public – as well as practicing attorneys, legal scholars, law enforcement and corrections officers, policymakers, educators, advocates and prisoners – with the first centralized, comprehensive source of information on solitary confinement in the United States. This story first appeared on Solitary Watch. As communities across the West Coast are gearing up for a day of action in Sacramento tomorrow, national and international support continues to grow for the hunger strike, against torturous conditions and practices of imprisonment. Solidarity actions will be held in New York City, Chicago and Hartford in support of the hunger strike in conjunction with the public hearing in California. Follow us on Twitter! For fresh updates from the rally and hearing in Sacramento, follow Whitney86 or search #PBHearing. For a live audio broadcast of the hearing, visit the California State Assembly’s website: Tuesday, Aug. 23, from 1:30 – 3:30 p.m. PST. CDCR HAS LONG HISTORY OF RENEGING OR BACKSLIDING AFTER AGREEING PUBLICLY TO MAKE CHANGES WON BY CONCERTED ACTIVITY. DISORDER AND CHAOS MEAN BIG BUCKS FOR PRISON GUARDS SO LEGISLATIVE CHANGES TO SOLIDIFY GAINS PLUS OVERSIGHT WILL BE CRUCIAL. REMEMBER THAT IT TOOK THELTON HENDERSON (9TH CIRCUIT APPELLATE COURT) nd SPECIAL MASTER TO OVERSEE CHANGES TO PRISON HEALTH CARE AND THEE STATE CONSTANTLY MALINGERS AND DELAYS RATHER THAN STEP UP AND LEAD. It is an awful shame when prisoners have to go on hunger strikes in order for fair justice to prevail and even then these prisoners are not guaranteed their efforts will be successful. We all need to keep them in prayer and hope that the Human Rights' Organizations will do their job/s and achieve. Peace and Solidarity to all prisoners and prisoner advocates around the country and the world. Last I checked, the scumbags in SHU are the most dangerous dirtbags in the criminal system. The dirtbags holding the signs are gang members and associates of the dirtbags inside prison, they are the foot soldiers on the outside. The true 'VICTIMS' here are the innocent person(s) who were victimized by the animals locked up. If there is a God, He wants us to LOVE ONE ANOTHER–no exceptions. It IS hard to love some people whether they are outside or inside prison, believe me I know. But torturing and being mean to people is wrong and degrades US as well as them. I belive the answer and cure is kindness, love, and new healing modalities such as Reiki and the Bruno Groning Circle of Friends. If you become a member of the latter, which is free (donations only), you will be able to get healing for yourself and your loved ones AND you can also send it to prisons and prisoners. Maybe then those you call "dirt-bags" will change and become decent people and repent of their sins. Isn't that really for the greatest good of all concerned?